As we go to wind down our coverage of the Washington basketball program, we head back to Ben Knibbe of UW Dawg Pound for his perspective on the Huskies. Here’s our conversation on the immediate future for Lorenzo Romar and Washington. RTC: Washington loses Tony Wroten, Jr., and Terrence Ross at the guard spot. Will the role there be filled “by committee”, with C.J. Wilcox and Abdul Gaddy leading the charge, or something else? BK: While the losses of two NBA lottery talents in Wroten and Ross will sting, the Huskies have the depth to survive the loss. The production of two such talents can rarely be reloaded with the ease John Calipari displays at Kentucky. Coach Lorenzo Romar almost always is deep at the guard position, and this coming season will be no different. Ross’ outside shooting will be replaced by the return of senior guard Scott Suggs. Suggs redshirted last season after suffering a foot injury before the season started, and while he could have returned partway through the season, he decided to redshirt and play in this upcoming season. Suggs also has the ability to handle the point guard position in a pinch. Wroten may have been a major talent, but he frustrated many Husky fans, myself included, with his constant boneheaded mistakes, ball dominance and complete and utter lack of a jump shot. His slashing ability will be replaced by redshirt freshman Andrew Andrews. Andrews impressed in practice, and is considered a talent that just has to be put on the floor. There will also be the maturation of a healthy Gaddy and Wilcox. Gaddy was never completely confident with his knee following tearing his ACL in practice his sophomore season; Wilcox was not only limited in practice after suffering a stress fracture in his femur, he was relegated to 50 jump shots per day as his entire practice. I may be in the minority on this, but the growth and healing process or Suggs, Gaddy, and Wilcox, combined with the addition of Andrews and junior college transfer Mark McLaughlin (more on him later), will more than replace the losses of Wroten and Ross. RTC: Did you think Washington deserved to be in the NCAA Tournament last season, or did losing the final two games before Selection Sunday seal their fate? BK: This is a tough question to answer, as I believe that the champion of the Pac-12 should make the Big Dance every year, but the Pac was having a down year, to put it lightly. The close losses to Marquette and Duke in Madison Square Garden hurt the Dawgs, as just a few different bounces caused the outcomes to be different. Regardless, the Dawgs lost those games so the selection committee sees nothing other than a lack of a W. The late season losses to UCLA and Oregon State sealed the fate of the Huskies. While the loss at UCLA alone did little damage to the tournament resumé, coupling it with the loss to Oregon State in the Pac-12 Tournament ruined any chances the Huskies had of making it in. Regardless of the eyes of the selection committee, I personally think that the Huskies should have been in. Winning the Pac, in any year, should have done the job. The Huskies also are always a team-you-don’t-want-to-play-because-they-are-peaking-at-the-right-time. I think this should have gotten the Huskies an invitation to play in the Big Dance, but I can understand the decision to exclude them. RTC: What happened in those final couple of games? We know the defense wasn’t spectacular, late-game free throw shooting was awful, and the offense went through mini-lapses at times when they couldn’t put the ball in the hoop. What contributed to those things, and was there anything else? BK: For this one I had to go back and read my recaps of the games to remember what all went wrong. I missed the Oregon State game so I cannot speak much to how that turned out. Meanwhile, the UCLA game was just frustrating to watch. Stagnant offensive possessions filled the night, as Wroten put off too many attempts near the rim with three defenders collapsed on him. 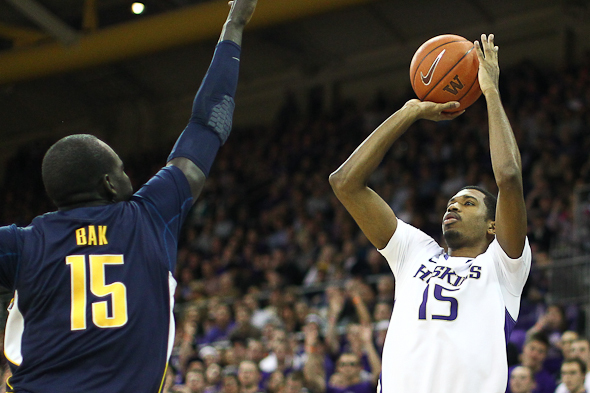 Defensively the Huskies struggled to defend interior passing. Travis and David Wear had solid passing nights, but the Huskies allowed too many free cutters through the lane. I think this was the ultimate undoing of the Huskies in their final regular season game. RTC: Let’s go into some expectations, player-wise, for next season. What are your thoughts on sophomore Shawn Kemp, Jr. and incoming junior Mark McLaughlin? BK: These are two potentially boom-or-bust prospects for the coming season, so I will start with the one who I believe has a better chance to have a larger role on the team: Kemp, Jr. Kemp played some reserve minutes last season, but ultimately lost his role on the team when Austin Sefarian-Jenkins took a spot on the team. Kemp had the role of backing up Aziz N’Diaye. While Kemp showed flashes of being a solid contributor, he was inconsistent and did not provide the rebounding the team was looking for out of the position. With a full year in the system I believe that he can become a solid contributor off the bench. He also has the possibility of being a non-factor this season. Time will tell. With McLaughlin, things are interesting. He was the leading scorer in all of junior college basketball last season, so we know he can score. We don’t know for sure how well it will translate to the Division I level and also if he has the ability to play defense in Romar’s system. He has a chance to be here for one year then bolt to the NBA, or the chance to be a total non-factor in his two-year Washington career. I expect somewhere in the middle – a solid role player and offense off the bench, and a sixth man in his senior season. RTC: Which newcomer do you think will have the biggest impact in 2012-13? BK: Andrew Andrews, without a doubt. Andrews’s slashing ability will be invaluable to putting points on the board. His quickness will also cause turnovers on the defensive end, leading to fast break buckets for the Huskies, which happens to be their bread and butter. RTC: Name a sleeper player if he isn’t different from the guy above? BK: My sleeper would be redshirt freshman Jernard Jarreau. Jarreau was a guard for most of his time in high school until a massive growth spurt put him on prospect lists around the country. He was able to add some weight to his slender frame to allow him to take contact better than he could before, which was not well to say the least. He brings guard skills with him to his 6’10” frame, thus creating a matchup issue for anybody guarding him. This guy could end up shooting up NBA Draft boards during the course of his career. No guarantees come with somebody not used to their body, but if he can figure everything out, Jarreau will be a scary matchup that opposing coaches will lose sleep about. RTC: Desmond Simmons played much more in his freshman season than what was originally expected. He did some good work on the glass, but how do you see him rounding out his offensive game in his second season in Seattle. BK: Simmons got most of his offense via offensive rebounds last season. He is definitely a “glue guy” who will set screens, grab boards and play tough defense. His offensive game will probably develop into a Darnell Gant-type player. A good spot-up shooter and athleticism to finish around the rim. Simmons did attempt to score off the dribble with moderate success last season, so his face-up game shows some promise, but his shooting is the thing to look out for. Gant made a leap when it came to his shooting, and look for Simmons to improve that more than anything else. RTC: Let’s say the Huskies make it to the Sweet Sixteen next year. Who is the most important player to lead them there? BK: This is a toss-up between three players: Gaddy, Wilcox and Suggs. I personally have a higher ceiling for Gaddy than most others, so I would be inclined to go with the point guard. I think that his ability to get into the lane will improve as he is further removed from his knee injury, and that combined with improved outside shooting and his deceptive ball-handling skills will allow him to lead the Huskies and be their best player. RTC: What are your thoughts on Washington’s new transfer, former Florida International center Gilles Dierickx? BK: Dierickx is going to be a replacement for Aziz N’Diaye. After thinking about it, I like the pickup. While he may not have the star power, he will be a defensive anchor while being a threat on offense that defenses cannot ignore, allowing driving lanes to be opened for wings. Dierickx is a decent shot-blocker, which will help to force more outside shots that the always-athletic Huskies will take advantage of. RTC: Your way-too-early prediction for 2012-13? BK: I like being optimistic: Sweet Sixteen. This entry was posted on Sunday, July 15th, 2012 at 5:13 pm by Connor Pelton	and is filed under microsites, pac 12. Tagged: abdul gaddy, andrew andrews, austin seferian-jenkins, Aziz N'Diaye, bk, c.j. wilcox, jernard jarreau, lorenzo romar, mark mclaughlin, rtc, Scott Suggs, shawn kemp jr, terrence ross, tony wroten jr, washington, washington week: q&a with uw dawg pound's ben knibbe. You can follow any responses to this entry through the RSS 2.0 feed. You can leave a response, or trackback from your own site.